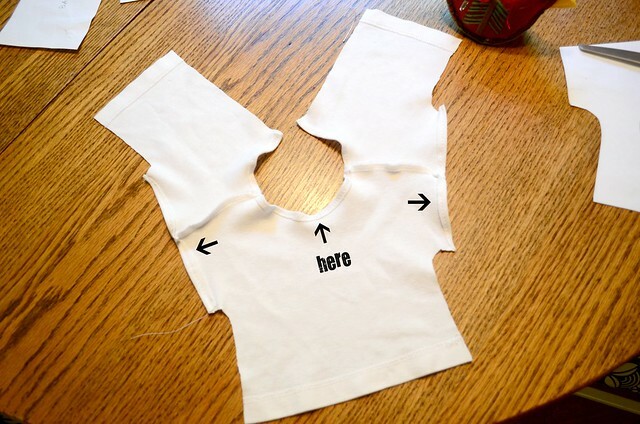 Cut out your pattern pieces. The front piece is cut on the fold. 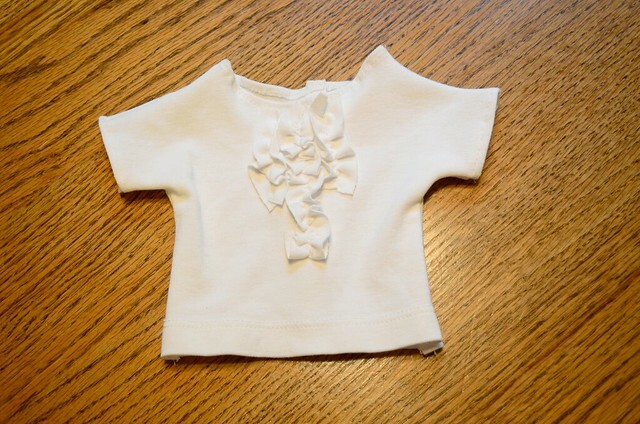 I used the existing hem from a t-shirt so that I would not have to hem the doll shirt. 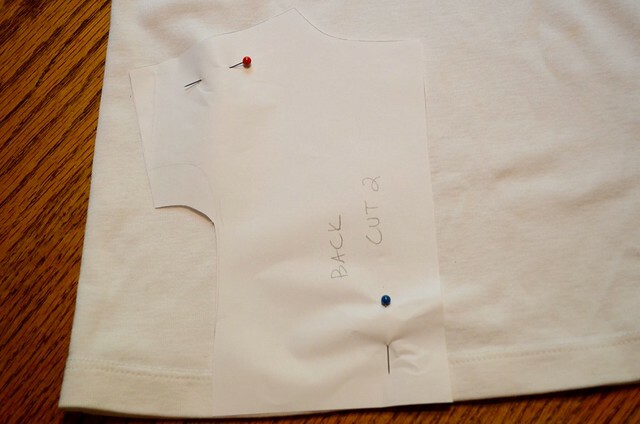 Cut out the back pieces. Cut 2 and make sure they face in opposite directions. I cut these pieces using the hem as well. 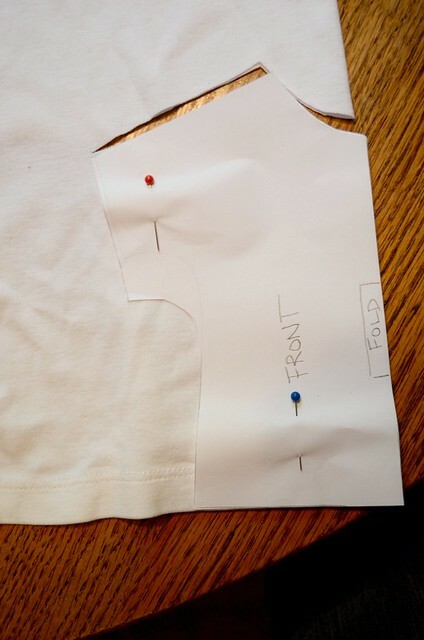 Open up the front piece and place the back pieces on top of the front piece with right sides together. 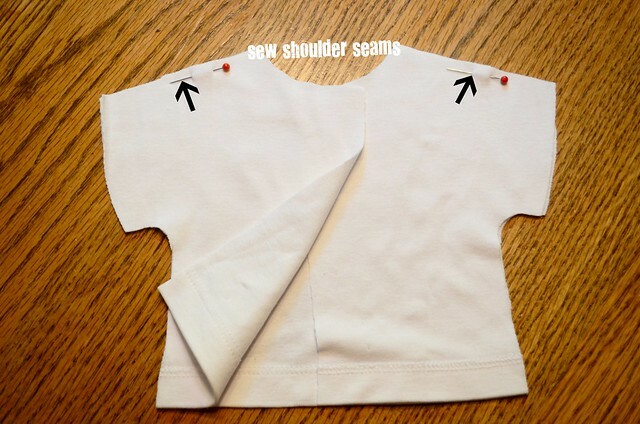 Line up shoulder seams and stitch across. Now hem the arms and neck openings. I just folded the fabric over 1/4 inch, since it is knit it will not fray. With right sides together sew from the arm all the way to the bottom hem. Now attach the velcro. 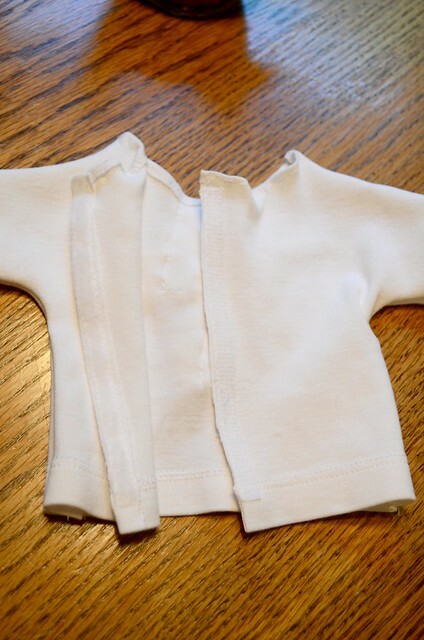 Fold over one side so that you can attach velcro to the inside of the shirt. 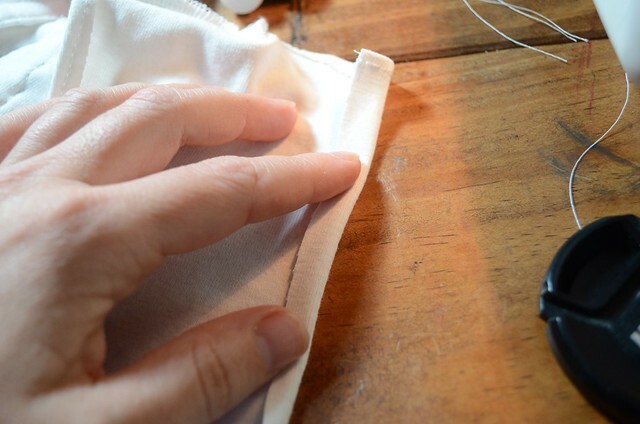 Sew the velcro on top of the folded edge. I usually take a piece of velcro and cut it to the length that I need and then cut it in half lengthwise so that it is skinnier. 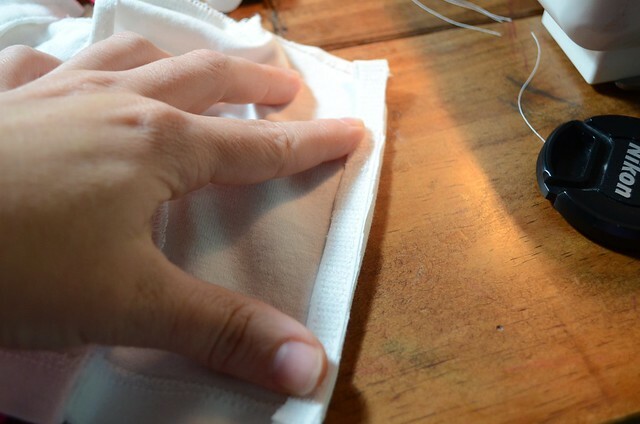 Sew the velcro on the other side along the outside edge. I do not fold this edge over. Embellish the tee or leave it plain. If you make any doll tees, please remember to add photos to my flickr pool. This is so cute! 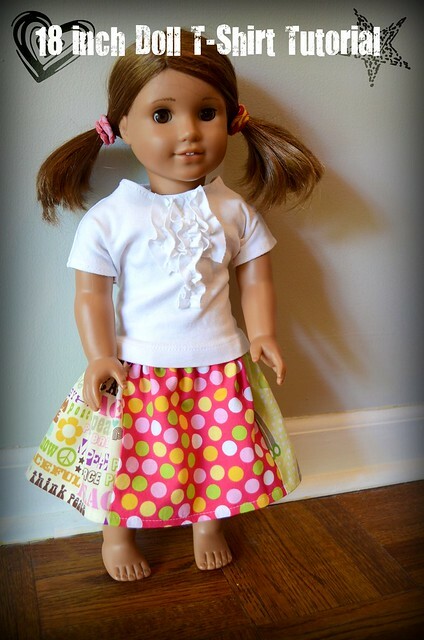 It's thing like this that make me want a girls so I can make doll clothes. I just can't get into the crashing of matchbox cars over and over and over again. 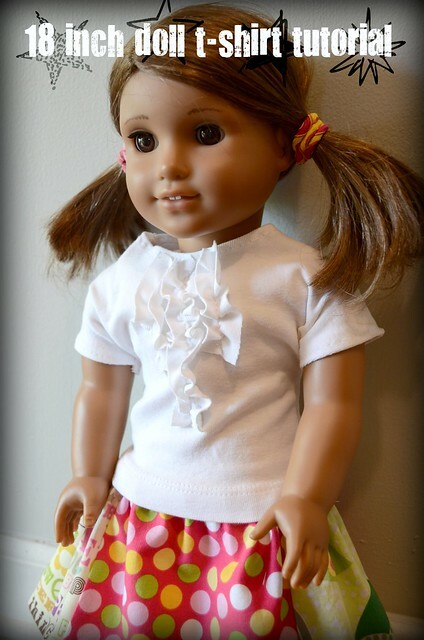 Thanks so much for sharing this pattern with us... made one for my daughter out of a "ruined" pink tee shirt of mine! Very cute and simple. What did you do to make the embellishment on the front of this one? Was also wondering how you did the embellishment on the front. Do you have a tute for that? This worked SO perfectly! Thanks! I have made a lot of shirts from this pattern tutorial. Thank you so much for posting this. Thank you so much for the tutorial. Very Cute I'm going to try this on a ruined T-Shirt I have. You are very clever. Thanks again. OMGoodness! 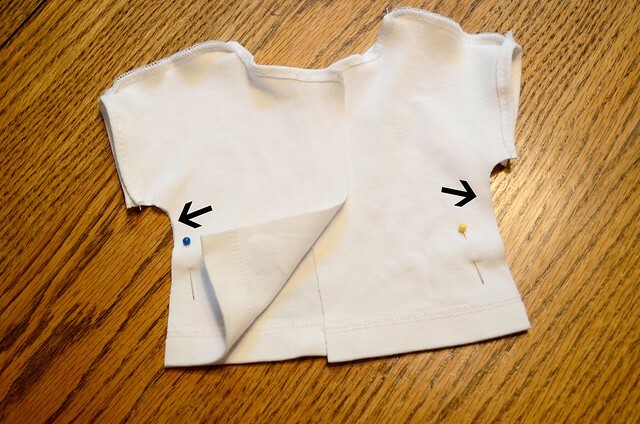 I struggled SO MUCH to hem a t-shirt sleeve that I gave up on doll clothes! This tutorial HAS SAVED ME!! THANK YOU!!! I have used this pattern over and over and over again! I made the back wider to use cotton for blouses, I've lengthened the sleeves and turned it around to make a cardigan, I have lengthened and flared it to make a tunic to go with leggings, and I've shortened it and added a skirt for a dress! I don't do sleeves, so this was perfect for me! My granddaughters LOVE it!!! Thanks! Super easy!!!! Dud the whole thing by hand because my machine is on the blink but my daughters needed another white T-Shirt ASAP. I did the whole thing by hand in about an hour! We will recycle many old t-shirts this way!!! Giaonhan247 chuyên dịch vụ amazon đức, mua hàng trên amazon vietnam với giải đáp đồng hồ amazon, vòng tay pandora ý nghĩa như thế nào, dịch vụ trang web mua hàng mỹ cũng như hướng dẫn cách mua hàng trên ebay uy tín nhất.